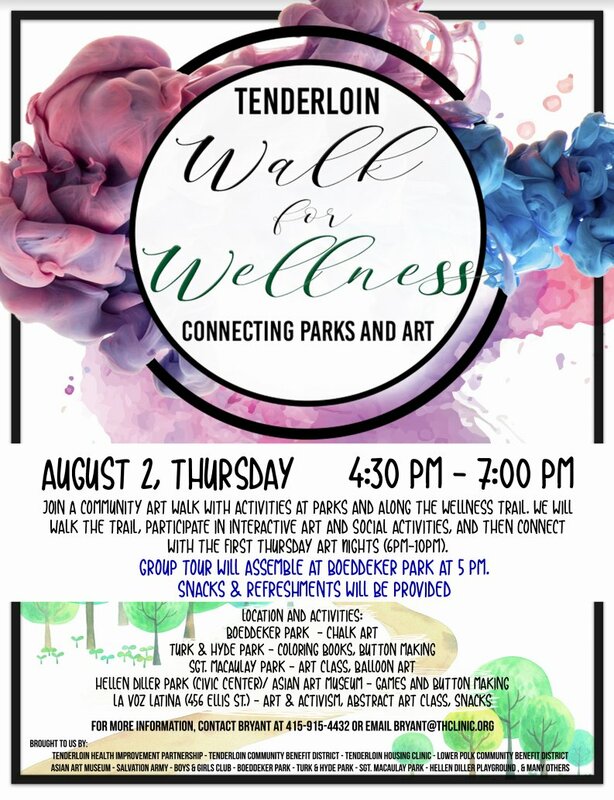 Welcome to the first Walk for Wellness event highlighting the parks, art, and people in the Tenderloin! Join a community art walk with activities at parks and stops along the Wellness Trail. Participate in interactive art and social activities, then connect with the First Thursday Art Nights (6-10PM). With limited parks in our neighborhood, it is important that they feel safe, welcoming and are used by our community. Boeddeker Park was renovated in 2014. Civic Center Playgrounds were renovated earlier this year. Turk and Hyde Mini Park and Sgt. Macaulay Park will be renovated next year (estimated to begin in January/February 2019). The Wellness Trail looks to connect these parks together and encourage health and wellness across the community.